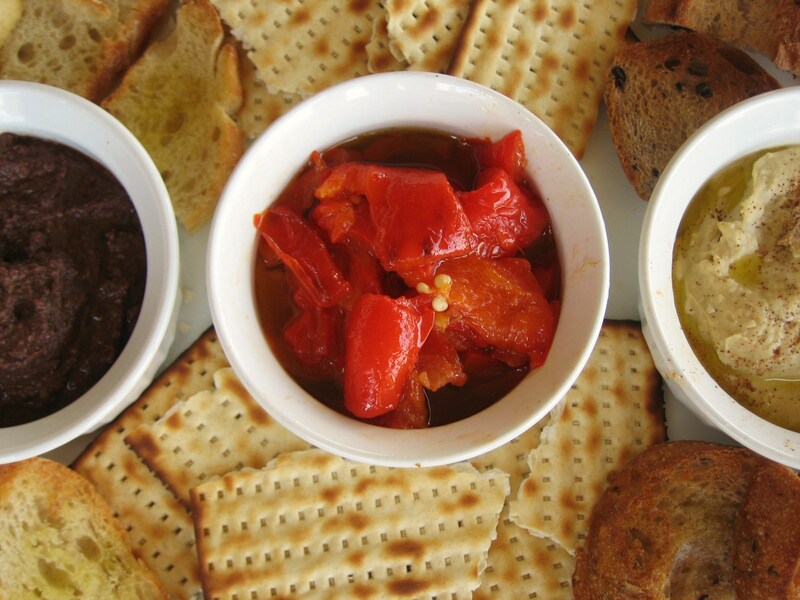 An incredibly easy appetizer trio that will wow your guests. 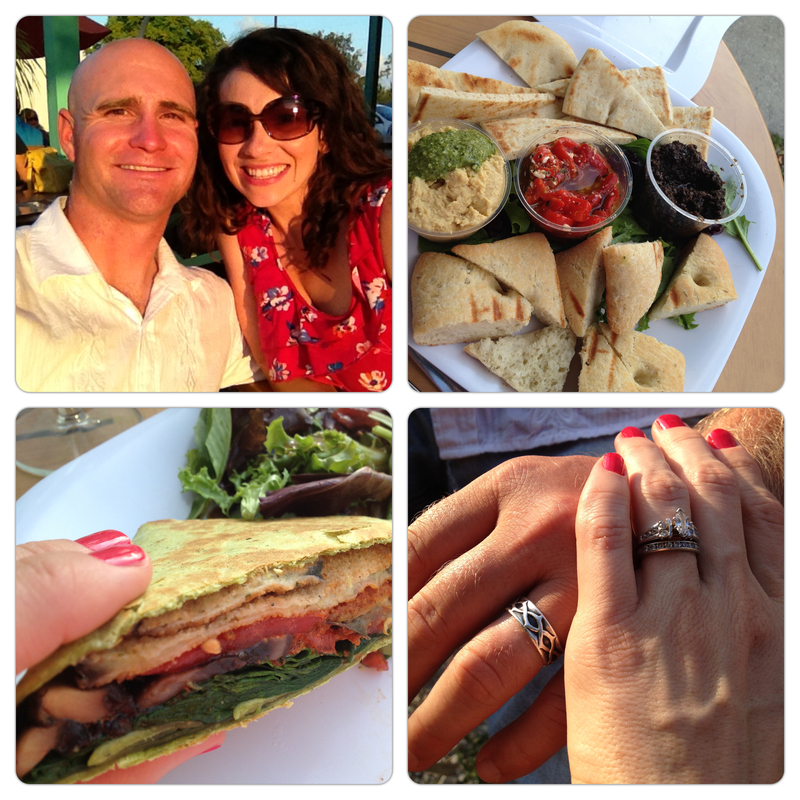 Last week on vacation, Jared and I celebrated our anniversary at this adorable little wine bistro and had the most beautiful flavorful appetizer trio of hummus, marinated roasted red peppers, and olive tappenade. Though I love olives, I’ve somehow never eaten or made tappenade. I’ve been missing out. I immediately knew I wanted to recreate this rich briny dip when I got home. In fact, I wanted to recreate the whole trio, maybe even the whole evening. Florida sunshine, live acoustic musicians, a handsome and charming date in flip flops, good wine (at happy hour prices), a flirty sun dress, and delicious simple food. This is my idea of a perfect evening out. I told Jared between sips of chardonnay, “I’m so glad we aren’t all dressed up in stiff uncomfortable clothes, surrounded by a bunch of “fancy,” wealthy people pretending to be something we are not.” His wallet, I mean he, agreed. 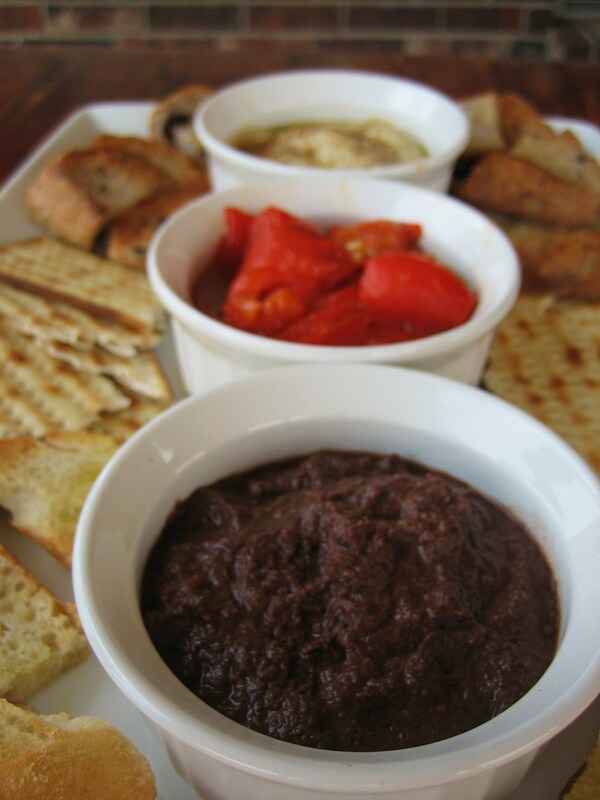 This trio of dips is the perfect entertaining appetizer. It presents beautifully and looks sophisticated, but it’s really all incredibly easy to make. You can make it up to a couple of days in advance, then set it out before your guests arrive and forget about it. I picked up a tub of hummus this time and just jazzed it up with a drizzle of olive oil and a sprinkle of paprika. 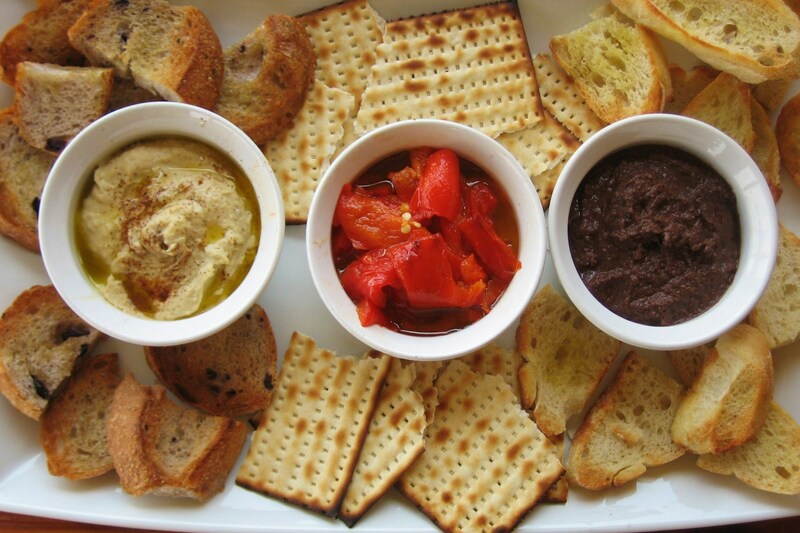 Of course, you can easily make your own hummus too. Mix all ingredients in a blender or food processor, scraping down the sides as needed. Blend until the olives are chopped very fine — a little chunky is fine. I used a magic bullet and it worked perfect for this size batch. A small food processor would probably result in a tappenade with a little more texture. Serve with toasted bread or crackers. I used one ciabatta roll, one olive loaf roll, and Mediterranean matzo crackers. The bistro we went to served rosemary focaccia and pita bread with theirs. *To quickly pit the olives, whack them with a meat mallet and pop the pit right out. I knew I hung onto my meat mallet for some reason! In a sauce pan, heat the olive oil and garlic on medium until the garlic is soft. Remove the garlic with a slotted spoon or fork. Place peppers directly on the flame of your gas stove top or under the broiler of your oven on a pan, turning until the skin is charred on all sides. Once charred on all sides, place immediately in a plastic freezer bag or in a bowl sealed tight with saran wrap. Leave for about 10 minutes (or longer). Discard the inner seeds and stem and gently remove the skins. A damp paper towel can help if they aren’t peeling off easily. Chop the peppers into large bite-size chunks. Pour the garlic infused oil over the roasted peppers, toss with the salt. Refrigerate for later use or serve at room temperature with toasted bread.